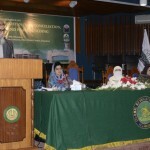 A seminar on “Role of Ulema for promotion of peace in society” at Islamic Research Institute (IRI) of International Islamic University Islamabad (IIUI) has called upon Muslim societies to devise a comprehensive strategy against Islamophobia with a close linkage between Ulema and educational institutions. The seminar was attended by Advisor of Shaikh Al-Azhar Muhammad Mohanna as chief guest who said that islamophobia was a lethal plan against Muslims by few negative elements who have a very clear idea about Islam’s message of peace but they are trying to deteriorate its image. “Islam is religion of peace, love and tranquility, Muslims will have to protect this image and they must disseminate the actual image across the world” continued Dr. Mohanna. He termed Paigham e Pakistan as a vital narrative for Muslim world and said that Al-Azhar supports this important effort of Pakistani Ulema. Dr. Masoon Yasinzai, Rector IIUI said that Ulema have unprecedented role in promotion of Paigham e Pakistan. He said that the narrative was being recognized across the effort even in United Nations. He gave a glimpse of the efforts of IRI and IIUI in formation, dissemination and promotion of Paigham e Pakistan narrative. Dr. Masoom also hailed Al-Azhar for the continued cooperation and said that IIUI was having a vital support from Al-Azhar in form of Egyptian teachers. He thanked Al-Azhar and Dr. Mohanna for cooperation with IIUI. 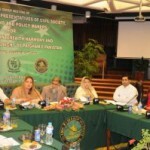 Dr. Muhammad Zia ul Haq, Director General IRI apprised about objectives of the seminar and thanked the participants. 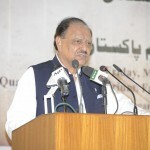 He elaborated the role of Ulema in promotion of peace in societies. Earlier, in the meetings between IIUI Rector IIUI Dr. Masoom Yasinzai and President IIUI Dr. Ahmed Yousif Al-Draiweesh, Dr. Mohanna discussed bilateral cooperation, while points related to boosting educational ties also came under discussion. Later, Dr. Mohanna delivered Juma sermon at Faisal Masjid.